Lithium batteries are what allow electric vehicles to travel several hundred miles on one charge. Their capacity for energy storage is well known, but so is their tendency to occasionally catch on fire. This occurrence is known to battery researchers as “thermal runaway”. These fires occur most frequently when the batteries overheat or cycle rapidly. With more and more electric vehicles on the road each year, battery technology needs to adapt to reduce the likelihood of these dangerous and catastrophic fires. Researchers from the University of Illinois at Chicago College of Engineering report that graphene may take the oxygen out of lithium battery fires. They report their findings in the journal Advanced Functional Materials. The reasons lithium batteries catch fire include rapid cycling or charging and discharging and high temperatures in the battery. 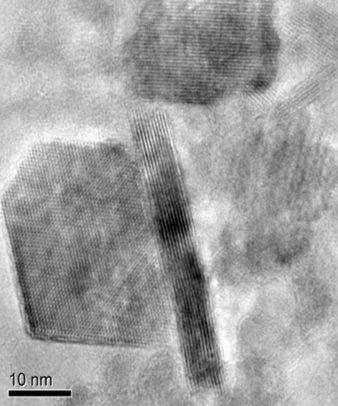 These conditions can cause the cathode inside the battery (which in the case of most lithium batteries is a lithium-containing oxide, usually lithium cobalt oxide) to decompose and release oxygen. If the oxygen combines with other flammable products given off through decomposition of the electrolyte under high enough heat, spontaneous combustion can occur. “We thought that if there was a way to prevent the oxygen from leaving the cathode and mixing with other flammable products in the battery, we could reduce the chances of a fire occurring”, said Reza Shahbazian-Yassar, associate professor of mechanical and industrial engineering in the UIC College of Engineering and corresponding author of the paper. It turns out that a material Shahbazian-Yassar is very familiar with provided a perfect solution to this problem. That material is graphene – a super-thin (single nanometers thin) layer of carbon atoms with unique properties. Shahbazian-Yassar and his colleagues previously had used graphene to help modulate lithium buildup on electrodes in lithium metal batteries. “The wrapped cathode battery lost only about 14% of its capacity after rapid cycling compared to a conventional lithium metal battery where performance was down about 45% under the same conditions”, Sharifi-Asl said. “Graphene is the ideal material for blocking the release of oxygen into the electrolyte”, Shahbazian-Yassar said. “It is impermeable to oxygen, electrically conductive, flexible, and is strong enough to withstand conditions within the battery. It is only a few nanometers thick so there would be no extra mass added to the battery. Our research shows that its use in the cathode can reliably reduce the release of oxygen and could be one way that the risk for fire in these batteries, which power everything from our phones to our cars, could be significantly reduced”. Please note, that original content could be edited for style purposes.